Last week I was lucky enough to be invited by the Grain Council to join Bob Harper in a Yoga class. Yes, I know, I won the jackpot on that one! We had a few quiet moment with Bob before the yoga began, and he offered some very sound advice to the room. Bob is all about balance, and he talked about whole grains being an important part of everyone’s diet. I’ve never been much of a dieter, so much of the diet (to lose weight) talk is off my radar. According to Bob we should have six servings of grains a day, with at least three of them being whole grains. I was surprised to find that America has forgotten it’s grains. I love a good crusty bread and my son devours oatmeal in the mornings. 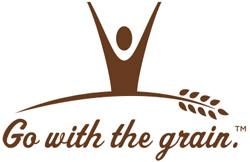 More information about the nutrition associated with whole grains can be found here. There’s something exciting I want to share with you, my readers. Right now, the Grain Council has a giveaway. One lucky person will win a flight to Los Angeles, and win a one on one training session with Bob. Win a free trip to L.A. and a one-on-one session with nationally recognized fitness trainer Bob Harper. Grain Foods Foundation is partnering with Bob Harper to help families live healthy, well-balanced lives and to encourage them to get their daily six servings of grain foods. I can tell you this. Spending a morning with Bob Harper was the loveliest morning I’ve had in a very long time. The yoga was incredible, his demeanor is engaging and soothing, and a half dozen of us walked out of that room standing a little taller and straighter than we’d walked in. In addition to being a vegetarian, a trainer, and a steward of our planet, Bob will have you loving your own body again. I’d be thrilled to see an ECP reader win this trip of a lifetime. « Nestle: Chocolate Chips or Advocate of Bottle Feeding? Bob Harper is being PAID by big industry!! Eating six servings of grains is NOT necessary for MANY and, in fact, is harmful for some!! …is DANGEROUS. Period. more specifics about one’s biochemical individuality is necessary in order to give such advice and I am surprised you would advocate that in your column! I repost MANY of your entries to my facebook page…this is one I am NOT sharing. How could eating whole grains be harmful? I really am confused by that?